Gourmia Electric Raclette Just $19.99! Down From $40! PLUS FREE Shipping! 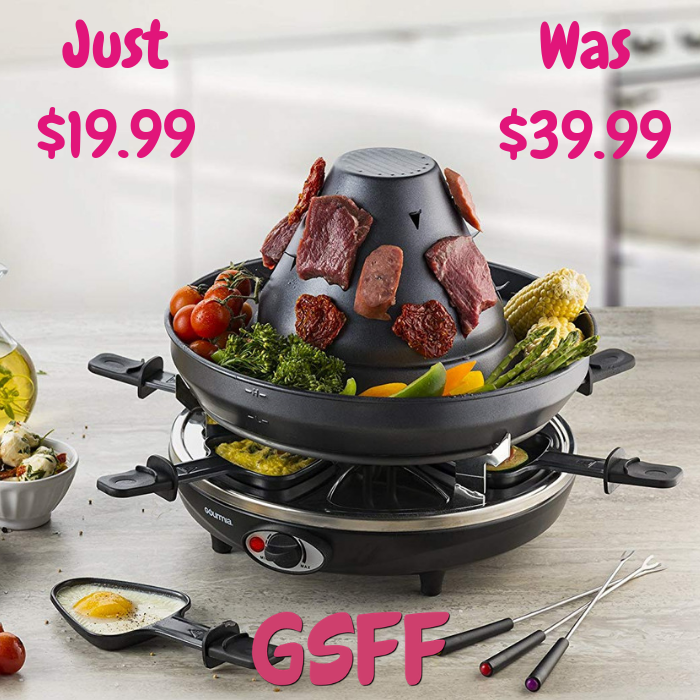 You are here: Home / Great Deals / Amazon Deals / Gourmia Electric Raclette Just $19.99! Down From $40! PLUS FREE Shipping! At Amazon, you can score this Gourmia Electric Raclette for just $19.99 down from $39.99 PLUS FREE shipping! Impress family and friends with an entertaining Raclette meal they’ll never forget With the Sizzlin’ Sombrero, a delicious culinary journey that begins in your very own kitchen! Whether it’s beef, chicken, seafood, or it’s veggies, breads or desserts, you’re sure to impress like never before! Party grill: turn boring, formal gatherings into fun, relaxed evenings with this interactive party grill! this modern raclette will have everyone grilling, dipping, and socializing for hours on end. Top that: sombrero top features a cone head to peg on meat or vegetables for quick grilling, and bowl for broths and steaming. Raclette pans: comes with 6 individual trays for cheese melting to dip and drizzle on your freshly grilled creations. Easy to use: adjust temperature level with the turn of one simple dial. Non-stick body for easy cooking and cleaning.